Quite often, different aspects of my research come together, to create a topic that belongs as much on one website as another. This was certainly the case with the minor planet Ceres, which is to be found in the Asteroid Belt, out between the orbits of Mars and Jupiter. Ceres has a definite relationship with Washington DC but it came to my attention because of my research into Earth's Moon. My findings regarding Ceres also brought to light the significance of an ancient Mexican site at Teotihuacan. This is the Pyramid of the Moon at Teotihuacan in Mexico. Nobody knows for sure just how ancient this gigantic site actually is but it was already old when the Aztecs occupied it in the early 15th century. However, one thing is obvious; it was built using a measuring system identical to the Megalithic measuring system used in Britain and France as early as 3,500 BC. Other Meso American sites may also have used the unit of measure known as the Megalithic Yard but as yet there is not enough evidene to be sure. During my research with Christopher Knight for our book Civilization One, we set out to prove or disprove the existance of a supposed ancient measuring system that had been used to create hundreds of stone age and bronze age sites in Great Britain and France. 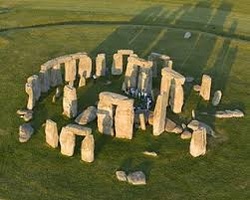 Stonehenge, on the left, is probably the most famous of them. Not only were we able to demonstrate that the Megalithic Yard was a reality, we were also able to show that this unit of 2.722 ft (82.966 cm) was merely a part of an intigrated measuring system that was based on the size of the Earth. Allied to this was a geometry that had 366 degrees to a circle, as opposed to the 360 degrees we use today. A really strange fact was that the whole Megalithic measuring system applied not only to the Earth, but also to the Moon. Earth's Moon is huge in comparrison with the size of the Earth. Most moons in the solar system are tiny when set against the size of their host planets. During our research into the Megalithic system of measurements we discovered just how odd the Moon is and you can read about this in my Who Built the Moon website. All of the peculiarites regarding the Moon stem from the fact that it is 3.66 times smaller than the Earth. One way of looking at what this means would be to say that if the Earth has 366 Megalithic degrees, then Earth's Moon would have 100 of the same sized degrees. This throws up all manner of relationships between the Earth and the Moon that should not really exist at all. It was while I was researching how the Moon had come to be made that I was introduced to the Asteroid Belt. I became convinced that the material that made up our Moon had come originally from the Asteroid Belt. Some experts think the Asteroid Belt was once a planet in its own right, whilst others suggest the various fragments never fully formed into a planet when the solar system came into being. Most of the Asteroid Belt is composed of very small fragments of rock but there are a couple of larger bodies, the biggest of which contains 1/3 of all the matter in the Asteroid Belt. This is a minor planet of rock and ice called Ceres. You can see what it looks like here. The really peculiar thing about Ceres is that it has the same ratio relationship to Earth's Moon, that Earth's Moon has to the Earth. The Moon is 3.66 times smaller than the Earth and has 1/81st part of Earth's mass and Ceres is 3.66 times smaller than Earth's Moon and has 1/81st part of the Moon's mass. It seems quite obvious to me that Ceres is an engineered object just as surely as Earth's Moon is and that it was deliberately left in the Asteroid Belt as the most obvious clue possible of where Earth's Moon came from. It is quite absurd to suggest that these ratio relationships could be down to simple chance. It is already observed that the mass relationship between the Earth and the Moon is almost impossible to believe, so the same disparity between the Moon and Ceres totally rules out the likelihood of coincidence. It is a fact that the Megalithic Yard was used extensively in the creation of Washington DC - and was still being used at the end of the 20th century. It is also a fact that Teotihuacan was planned and built using the same unit of measurement. They are divided in time by well over 2,000 years, which means of course that Washington DC did not exist in any shape or form when Teotihuacan was built. What is the chance therefore that there could be any Megalithic link between them? Such a possibility would seem to be absurd - but in fact a very clear and carefully defined link does exist and it is one that anyone could check for themselves. This is the Ellipse in Washington DC, which stands just south of the White House. The centre of the Ellipse is the major hub from which almost all the Megalithic measurements in Washington DC originate or terminate. If we measure the distance between the centre of the Ellipse and the centre of the Pyramid of the Moon at Teotihuacan we find it to be. 2986 kilometres. This is the same measurement as the circumference of the minor planet Ceres! This is also a very significant measurement in its own right because it represents the circumference of the Moon divided by 3.66, which is the most magical number in the Megalithic system. So, the circumference of the Earth divided by 3.66 equals the circumference of the Moon, and the circumference of the Moon divided by 3.66 equals the circumference of Ceres and also the exact distance between the Ellipse in Washington DC and the Pyramid of the Moon in Teotihuacan. As Chris Knight and I demonstrated in our co-operative books and as I have shown time and again since, Earth's Moon is undoubtedly an engineered object. See the Who Built the Moon website. Whoever or whatever built the Moon clearly wanted to leave evidence of what they had done, and they left that evidence in terms of very specific and very pointed clues. It is obvious that they did not want any of these clues to be misconstrued or passed over as mere coincidences. The presence and size of Ceres is one of the best examples. The makers of the Moon created Ceres and left it in the Asteroid Belt to show that they had taken most of the material for Earth's Moon from the Asteroid Belt. They gave Ceres a quite remarkable relationship with the Moon in terms of its size and mass and they also replicated its circumference on Earth, between Washington DC (which is the most Megalithic city ever created) and another Megalithic city from the past, Teotihuacan. 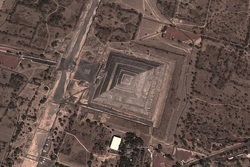 And to make certain there could be absolutely no mistake, this measurement of 27.322 Megalithic degrees or 2.986 km ran from the Megalithic hub of Washington DC - the middle of the Ellipse, to the Pyramid of the Moon in Teotihuacan. It is extremely hard to fathom how such point specific evidence could possibly be ignored.